Last Thursday I made a blog post about how my internet suddenly stopped working on my phone. I didn’t expect anything to come out from it, I just assumed it would eventually fix itself. The next morning (Friday) I was on my way to college and still no internet on my phone, I was annoyed over this as it was over a day now not working. Then around half 10 I got a text from twitter which was a message from VodafoneIreland saying that they saw my post and they will look into it and get me sorted! Didn’t expect that! So since I had no access to the internet, once I got home I replied straight away with my mobile number through Direct Message and then within a short time I was back up and running and had my iPhone back running with its full potential, after all a Smartphone is useless without a connection to the internet! 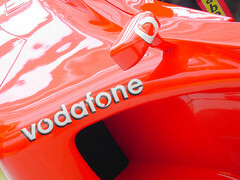 So I am thoroughly happy with the help I got, and the person that helped me out was Paul from Vodafone. I recently switched over to the Vodafone network from o2 and up until now I have been happy with everything, that was because everything worked! But today the internet broke! Shock, everything was falling apart without internet 😮 . Okay it wasn’t that bad, however it is unusual that the internet would go down for that long. Usually I would check my email and the likes of that and whenever I am in class whenever I become bored (which is a lot of the time!) I would look up some news. Anyway today is a short day for me, even more so that I was a bit late for college! But not having the internet on my phone was a bit of a pain! I went into town to see if it was just my phone that might of had a problem but it turns out there is a huge outage in the area. Over the past few weeks I have had a fair few assignments due and I have been barely able to meet the deadlines. Every night before the deadline I would be up late trying to get the assignment complete for the next day. Luckily each time I manage too. Most of the time assignments are just complete ‘waffle’ , all you have to do is read up on a topic and put your own spin on it and throw in your views and there you have your assignment. Although sometimes reading up on things takes a long time, for example tonight I was doing an assignment and the material we were told to read was basically unreadable, it was all clumped together and not paragraphed. So the first thing I did was to separate it out into readable chunks, just after I did this a classmate of mine sent me his one, go figure, a bit late but they were basically the same! I also hate reading long amounts of text on screen, a few hundred words is fine, such as blog posts and news articles, but when it comes to the likes of whitepapers and essay sized notes, I need to have a physical copy of them, so today’s assignment on Dell I simply printed out, it came to a total of 20 pages and took a fair bit of time to ready fully and digest it. Once I had that done it was plain sailing from there, writing the actual report went really well and I am confident I have done enough to get a decent mark. And for once I have completed an assignment before its due! It is not due until Wednesday and I have completed it already! Maybe I could complete the rest of the assignments I have due for next week this week and it could relieve a load of pressure for me. First off, I meant to get this post up on Thursday, but as I have said in previous posts, work seems to be taking up a lot of my time. So Kinect came out here in Ireland last Wednesday (November 10th) and I had planned on getting it that day, it didn’t work out that way so I ended up waiting another week and I got it this Wednesday (November 17th). I also decided to get the new Xbox too, my old one is four years old and I am actually surprised it is still going, it also only had a 20gb hard drive! So I got a huge upgrade on Wednesday in terms of gaming power, I now have a 250gb hard! The main thing I notice are how quiet the new machine is compared to the old one, I actually have it on in the background now and I can’t even hear it, my old one was quite loud! Another thing that stands out the most is the size difference, it is so small compared to the old Xbox and the POWER BRICK its to tiny and light compared to the old one! 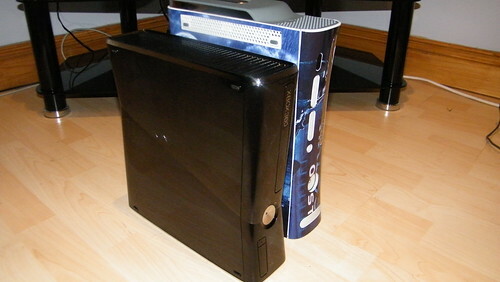 Below is a picture of my old and new Xbox, side by side! And now onto the main part of what I bought, Kinect! When I first took it out of the box, it was definitely a lot bigger than I had thought, when I was in Dublin a few weeks ago at GradIreland I saw it there but didn’t get to see it up close, and even though it is fairly big, it’s not that heavy. Something that freaks people out is that the head of Kinect is motorized and moves about, I think it’s strange but interesting! So once I finally got my old Xbox Live account transferred over to the new console I finally switched on Kinect and it was unbelievable. The setup was quick, and then I was straight into the game that came with in ‘Kinect Adventures’. This games is great crack, it has games from white water rafting to football like games and my favourite which makes little opstacales for you to doge and jump over, it is good fun and is tiring after a few hours of playing, at least I was :). I still can’t believe how responsive Kinect is, and I can’t get over the fact I am using my hand to move stuff on the screen, it’s just seems unnatural, but it is fun all the same. I am looking forward to seeing more games take advantage of Kinect, and I am now looking forward to the next star wars game coming out because I understand now how useful Kinect would be for it! I also bought the new Harry Potter game today, it too has implemented the Kinect sensor, I haven’t played it yet but I was looking though the Kinect features in the booklet and it looks like casting spells is where Kinect will be making the appearance, definitely looking forward to giving that a go! 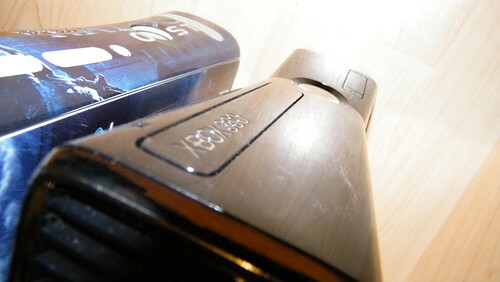 Something that annoys me about Kinect though is that its advertised to have voice control, however what they didn’t say is that Ireland wont be getting it until spring 2011! Like we speak English, so does the UK and US and yet they have it and we do not, I do not understand it at all, surely they could just let us use it but instead we have to wait! Something to note if you do get Kinect, I have a flat screen, the back is fairly big on it, at least as thick as the Kinect base, so I thought it would be fine to place it there, do not do this! I learnt it the wrong way! My Kinect sensor was calibrating when starting a new game and then the head on it went right back and tipped it over and it hit the ground, I nearly died when it happened, just spent a small fortune on it! Wasn’t going to have it break within the first few hours! So I now have it below my TV and it works fine there, although you need 6ft for one player and 8ft for two player so make sure you have a nice big room! 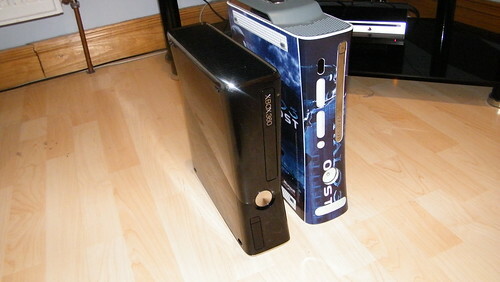 here is my setup of my Xbox and Kinect below! Ever since I got my playstation 3 last Christmas and found out that I can hook it up to a surround sound system through optical cables and have full 5.1 surround sound I have wanted to upgrade my system in my bedroom. 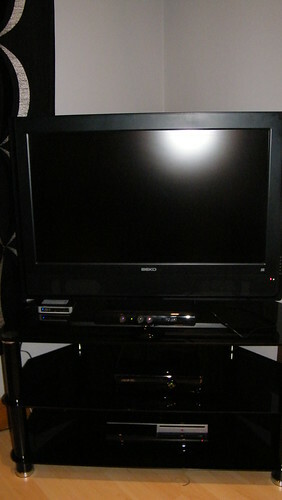 As it stands at the moment I have a HDTV, playstation 3 and xbox 360. 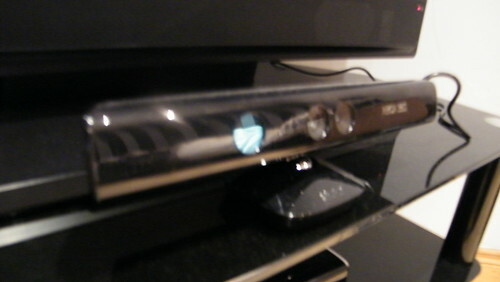 I am in the process of upgrading the xbox and last week I bought a hdmi switch. The reason I bought a hdmi switch is because my TV only supports 1 hdmi connection, I got it when hdmi was just becoming popular, nowadays there are multiple hdmi ports on TV’s. 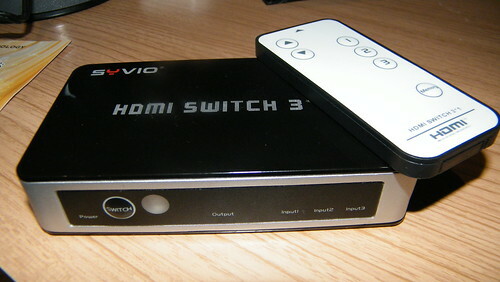 So I bought the hdmi switch which came with a remote control which allows me to switch between devices. I want to also invest in a home theatre system for my bedroom, nothing too fancy, just a basic DVD 5.1 surround sound system which supports optical input. The cheapest I have found is this sony system on Amazon. It is cheap since it supports optical, you can get other 5.1 surround sound system for cheaper but they don’t support the optical which I want. I plan to get this sometime after Christmas, and there may even be a sale on it then! So in preparation for this optical setup I have bought a few items tonight from Amazon, I bought 3 HDMI cables which were going really cheap, 3 optical cables and also a 3 into 1 optical switcher, the reason I got the switcher was because the surround system I am looking at only has 1 port for optical cables and since I will only be using 1 system at a time, it is more than enough. Once all these arrive, which should be late this week or early next week, I will have a full HD setup in my room, I just won’t be able to use the optical cables until I get the surround sound system, I just got the cables now since they too were going cheap! So with all this, my room is surely to be a bit over the top with electrics. I no longer use Sky in my room so I cancelled my subscription, and instead I will be linking into the sky which goes to the rest of the house.